Our summer program is key to the firm’s growth. 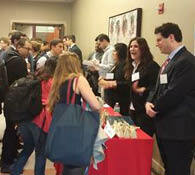 We recruit on campus by conducting individual interviews of second-year students at a number of law schools. For law schools where we do not recruit on campus, we strongly encourage students to send us a resume for consideration. While the majority of offers for Potter Anderson’s summer associate positions are extended to second-year students, each year a few first-year students may be considered for summer associate positions. Applications are accepted for first-year law students on or after December 1. Please send a cover letter, resume and transcript to recruiting@potteranderson.com. Summer associates are strongly encouraged to work at Potter Anderson for an entire summer. However, the firm will consider requests for split summers with another law firm in another geographical area on a case-by-case basis. Students who are invited to interview with Potter Anderson on-campus may be invited for a callback interview at the firm’s office to meet more attorneys. Callback invitations are typically extended shortly after an on-campus interview. The firm also conducts interviews for students who submit exceptional resumes outside of the on-campus interview process. During a callback interview, students will spend three to four hours meeting with partners, associates and our legal recruiting team to allow both the candidate and the firm to learn more about each other. Prospective summer associates requiring hotel and travel arrangements in connection with callback interviews should email recruiting@potteranderson.com for assistance. Offers will be made as soon as possible following callback interviews for summer associate positions with our firm. Potter Anderson is committed to providing the highest level of comprehensive benefits to its associates and its compensation package is consistently competitive with law firms in larger cities. For summer 2017, summer associates earn $3,077 per week. To see our complete benefit package, click here to view NALP Employer Information. At the conclusion of the summer program, Potter Anderson offers successful second-year candidates full-time associate positions with the firm upon their graduation from law school. First-year summer associates are not typically eligible to receive an offer for a full-time associate position until they have completed their second year of law school; however, they are eligible to receive an offer to return for a second summer with the firm. To apply for a summer associate position, second-year law students should sign up for an on-campus interview. If we were not able to meet you at your school or if we do not visit your school, please send a cover letter, resume and transcript to recruiting@potteranderson.com.